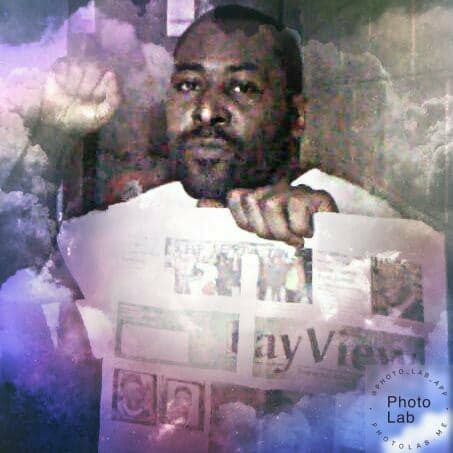 Kinetik raises a Black Power fist as he holds his June Bay View. With strength and optimism, I greet the Comrades and salute the Freedom Fighters! It has been a long ride, we have come a long way, yet there is so much work we still must do. And, I pen this expression with those in mind, who have committed themselves to the process and dedicated the time to actually DO THE WORK. In an article I wrote back in January 2014, in conjunction with our formal introduction of Free Alabama Movement (FAM) to the world, I spoke of “a flicker becoming a flame.” And, the threat of that flame blazing into a wildfire for change. To be in balance with the Universal Order, myself and hundreds of men confined within the Alabama DOC (Department of Corrections) decided to become the change we wanted to see. From ‘14 throughout ‘15 and ‘16 we worked, tirelessly, fanning that flicker – networking, mobilizing, organizing and educating – into a flame. Two and a half years later, in a coordinated effort, from Alabama to Ohio and all across the nation, that flicker turned into the National Prison Strike on the 45th anniversary of the Attica Rebellion. our unity, our message, our methods, our execution shook the economical underpinnings and exposed the continued inhumanities of America’s dirty little secret: SLAVERY. As a matter of law, the “peculiar institution,” draped in the clothes of the American policing and criminal justice system, never ended. But, as historical analysis reveals, all attacks against the institution will be met with extreme repression. True to form, due to our attack upon the “peculiar institution,” many comrades across the country are enduring the brunt of the repression. Ra’ salute to Comrade Malik, Bro Rashid, Imam Hasan, Bro Anthony Robinson, Bro Bennu and dozens of other brothers and sisters. The National Prison Strike on the 45th anniversary of the Attica Rebellion. our unity, our message, our methods, our execution shook the economical underpinnings and exposed the continued inhumanities of America’s dirty little secret: SLAVERY. I, myself, can be counted amongst that number, as many of my ordeals, prior to and since the Sept. 9, 2016, demonstrations, have been widely documented and publicized. To my extreme benefit, in the weeks leading up to the National Prison Strikes, I received a special visit from the law firm of Gespass & Johnson, representatives of the National Lawyers Guild. Their timing was perfect, as, due to extensive media coverage – once again, as in January of 2014 – the ADOC targeted me as the “leader” of the strikes in Alabama and sought to neutralize me. First, I was emergency transferred from Holman Correctional Facility to Kilby CF and placed under investigation, then to Limestone’s Behavior Modification Unit and eventually here to Donaldson’s Disciplinary Unit. They came with the pain, but the NLG provided a real cushion. I can honestly say that they “showed up early and stayed late.” As from that day to this one, they have stood with me and brothers from FAM (Free Alabama Movement) every step of the way. During the emergency transfers … they were there. During the hunger strike … they were there. During the “dry cell” … they were there. During the assault … they were there. During the Donaldson deprivations … they were there. The NLG provided a real cushion. I can honestly say that they “showed up early and stayed late.” As from that day to this one, they have stood with me and brothers from FAM (Free Alabama Movement) every step of the way. And, recently, it was them that filed a Habeas Corpus challenging my treatment and indefinite solitary confinement status. Since that filing in January ‘18, I have been moved from my “illegal” Disciplinary Segregation placement to the Administrative Segregation Unit, which corresponds with my classification status. Then, two days later, I was given six months’ worth of confiscated SF BayViews, Burning Spears, Socialist Viewpoints, Prison Legal News and other publications. Based upon the move to Admin Seg, for the first time in over four and a half years, in order to circumvent the Habeas Corpus allegations, I was allowed to go before the Segregation Review Board. However, they confirmed that without the commissioners’ approval, they couldn’t release me to General Population. A month later, they told me that they were making preparations to have me transferred again. Then, on June 21, I was taken to see the warden where I was informed that the commissioner had signed off on releasing me from segregation with the stipulations that HE WOULD NOT TOLERATE ANY PROTEST, STRIKES OR FREE ALABAMA MOVEMENT TALK. The next day, the classification specialist brought me the formal release papers. So, it appears that, after 54 months, any day now I’ll be released to the upper deck of this plantation. But, being that I know they are fully aware of the Aug. 21 Call to Action Against Slavery, for how long is the million-dollar question. Either way, in segregation or on the yard, the message is the same: SLAVERY MUST END … FREEDOM OR DEATH! Send our brother some love and light: Robert Earl Council, 181418, Donaldson CF E-23, 100 Warrior Lane, Bessemer AL 35023. And visit his website, at freerobertearlcouncil.wordpress.com.